The Rabbi with a Blog (Rabbi Jason Miller): Facebook Group or Private Social Network for Synagogues? Facebook Group or Private Social Network for Synagogues? In my last year of rabbinical school, I had an interesting conversation with a rabbi of a large congregation. He told me that he had put his foot down and refused to let his congregation create a synagogue-wide email LISTSERV. His rationale? This forum would be used by the membership to complain about the synagogue... and the rabbi. I gently suggested to my future colleague that if his members were going to use an email discussion group to complain about the congregation, they were likely already doing this in real-time at kiddush (the reception following services). He laughed and acknowledged I was correct. I'm sure that in the ensuing years he acquiesced and allowed for an email LISTSERV. Developed in 1986 by Eric Thomas, LISTSERV was the first email list software application. The simple LISTSERV, an automated mailing list manager, allowed for like minded individuals in a group to disseminate email messages to one another. The features of such a platform were minimal. The threads were difficult to follow. In digest format, there were several discussions arriving in the inbox all at once with no logical grouping order. Today, the email LISTSERV has long since run its course. Even the next generation of these discussion groups (Yahoo! Groups, Deja News which became Google Groups, the London-based GroupSpaces, etc.) are limited in features. Today, Facebook has made these discussion groups unecessary. 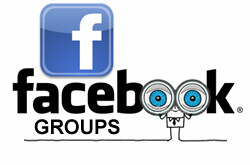 The Facebook Group application allows for the dissemination of rich content in a secure, private network. I have helped many synagogues transition from the old LISTSERV and email-based group platforms to the Facebook Groups application. As I tell rabbis and synagogue executives all the time: There are over 750 million Facebook users worldwide so there's a good chance that your congregants are already signed on. Facebook Groups allow for smaller cohorts within a congregation to have a forum to share ideas, documents, links to articles, photos, videos, and promote events. It is private and secure with at least one administrator monitoring the group. Recently, when encouraging synagogues to start using the Facebook Groups application, I've been met with some resistence. Facebook isn't secure, they argue. They've heard that there is really no privacy with Facebook. They argue that a Private Social Network must be the way to go. I disagree and here's why. Private Social Networks are certainly great apps and they have features galore. At first glance, applications like SocialGO and Yammer seem like the perfect solution for a company or organization that wants to have a social network that is open to only their employees or members. For many companies, these private social networks might make the most sense because once the employees are logged into Facebook, there will likely be many hours of unproductivity. Synagogues and temples are different however. In that respect, I say use the network where the members are already participating. And that is obviously Facebook. The Conservative Movement's Rabbinical Assembly recently announced a deal through a partnership with SocialGo that allows member rabbis to contract with the private social network company to create a web-based social network for their congregation. These private social networks have all the features and functionality as Facebook Groups, but cost a discounted $500 and then $25 per month. Facebook is free and everyone already has an account (or knows how to get one simply enough). Having people log in to another platform is tedious when they are already using Facebook on a daily basis and can simply use the Groups application to interface with the congregation's forums. In terms of privacy, these Facebook Groups are just as private as LISTSERV groups were and continue to be. One must request to be a member of the group or be invited to participate in the discussions and view the content. Breaches of privacy can happen the same way there can be a breach of privacy from a face-to-face conversation. A group is only as private as its members allow it to be. The bottom line is that congregations shouldn't complicate matters by creating their own private social network. It's unnecessary. Save your money because Facebook Groups will work just fine. I agree. We set up a Facebook group that now has nearly 300 of our congregants on it. It is transformative in terms of the democratizing of congregational communications - people share interesting Jewish links, ask advice (where can I get gluten free challah? ), seek help (looking for some babysitting help after day camp ends, needing new volunteers for our soup kitchen delivery...) as well as being a place that we can reach out to our congregants. it is closed and you have to be approved to join.